The Indian majors double their market share in just four years - what's the secret and can they be stopped? ...I would have at least a month's worth of app testing at my disposal right now. Many of these people are simply waiting for the world to return the ways of pre dot.com crash days, where clients paid the exorbitant fees of consultants for "transformation projects" and dumped hundreds of millions into dysfunctional ERP projects that often achieved little beyond creating meaningless work to support faltering processes, many of which are now rendered obsolete. I hate to be the hearer of bad news, but the world really has moved on since then, and the emergence of the Indian majors has been a bi-product of the emerging opportunities for enterprises to shed their bloat and create an environment to do things differently. Cloud computing platforms, improving analytics opportunities and the advantages of lower-cost global delivery are the three main game-changers in today's business environment - and this isn't going to change anytime soon. 1) Brand. India's brand in IT services has matured in last 5 years - whereas businesses, in the past, were seen to be using Indian offshore-centric providers for primarily low-cost services, now they are genuinely going to offshore-centric /India-based providers for IT value and knowledge, as costs have leveled out across all providers for bread-and-butter business and IT services. The offshore-centric providers increasingly benefit from India’s growing brand equity, as well as their own. 2) Customer satisfaction. Many clients like the more humble approach of the offshore-centric providers, where delivery managers are more flexible, and "going the extra mile" for clients is never an issue. Moreover, many of the offshore-centric providers’ account managers are not constantly trying to “go up the totem pole” within their clients to sell more services and undermine their client relationships. Client like to feel in control of their provider and the Indian approach often gives then that. 3) Client understanding. The "penetrate and radiate" strategy of the leading Indian offshore-centric providers has worked wonders. Once they have developed an understanding of their clients' institutional processes, their clients do not want to kick them out - even if they haven't performed as well as hoped. Getting to know the “warts and all” of clients creates an incredibly sticky and sustainable relationship. While many of the onshore-centric providers shy away from small projects as they like to concentrate in the big, high margin engagements, many of the Indian providers love to take on the small stuff, preferring to take the longer view that once they get embedded within a client, their opportunities will quickly emerge. Any advisors reading this will empathize with the enthusiasm of the Indian firms to chase after all types of business, not matter how small or unappealing it may often be. 4) Incentivized and entrepreneurial employees. 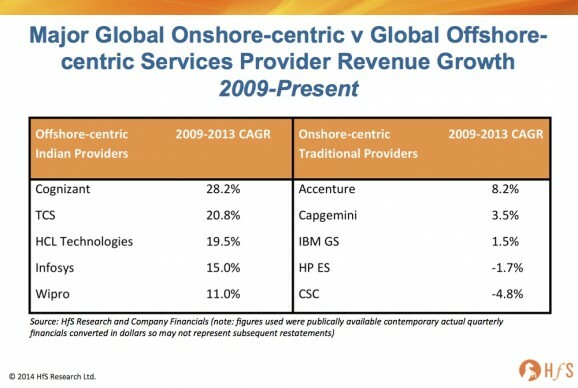 Offshore-centric providers have driven success within employees by offering incentive based pay and share options. This has helped to tie employee success and corporate success together. Anyone who's attended their sales offsites and customer events will quickly see how entrepreneurial some of their staff are - always keen to engage and build relationships. 5) Hunger. The offshore-centric providers are clearly hungrier for the business - always eager for more business and always eager to please their clients. Clients like hunger and determination, as long as it is supported by execution, which the offshore-centric firms work hard of achieving. In addition, when providers show passion and determination to please their clients, they earn a lot more forgiveness from their clients when they do mess up, as opposed to creating constant escalations and issues that can derail a relationship. 6) Aggressive pricing. 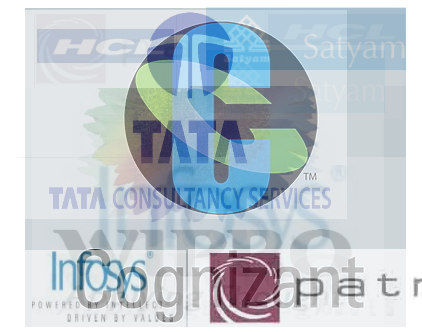 Both TCS and Cognizant are great examples of keeping the prices competitive, even when the Western providers, such as Accenture and IBM, have also brought their prices down to similar levels. Moreover, the Indian majors tend to carry much less overhead than their traditional competitors, where many have much thinner layers of management and administrative and marketing functions, which enable them to be much more aggressive when they need to drop the price points to win business. 7) Sticking to client commitments. The offshore-centric providers value strong customer relationships and, as mentioned above, often go the extra mile in a deal, this is just as true when things do not go as planned. When things don’t go to plan the offshore-centric providers are less inclined to "change order" their clients to death, which is frequently the criticism of their Western counterparts. 8) Innovation. In many cases client increasingly cite some of the Indian offshore-centric providers as innovative - constantly coming to them with new ideas, offerings and capabilities. They frequently see their client base as fertile ground to develop BPaaS platforms around client situations to be used with other clients, and are often willing to do this at much lower cost when compared to their illustrious competitors. Many take the longer view of building future business through new endeavors than simply trying to maximize revenue from current situations. While onshore-centric providers are also capable of providing great innovative offerings to their clients, some of the offshore-centric providers have surprised their clients with their ideas and capabilities. Sometimes beating client expectations with innovation is more important than selling innovation at $500/hour. 9) Executive relationships. Indian offshore-centric providers have done a great job of having their senior executives available for their clients, when requested - many of them have the mobile phone number of the CEO, even though the provider is well into the billions in revenues. Most senior clients have met the likes of Frank at Cognizant, Chandra at TCS and Tiger at Genpact, while very few clients of the big traditional providers are able to say the same about the Megs, Ginnis, Pierres etc. Most of the onshore-centric providers need to take a good look at the success of the offshore-centric providers and see what characteristics from these Nine Steps they are lacking. While many arguments can be made the the Indian juggernaut has to slow down (and it eventually will), these firms and their armies of passionate employees are not going away anytime soon. Quite simply, the traditional providers need to offer something different for clients that they actually need - and to be able to offer a level of service at similar costs that the Indian majors are providing. Yes, there are some real factors that could diminish the competitiveness of the Indian majors, namely rising domestic wages, rupee appreciation, robotic process automation, Cloud based offerings and the availability of skilled BPO staff, however they have proven very adept at protecting their existing business, while continuing to grow their market share. At the heart of all this is the genetic make-up of Indians. With non-availability of lot of resources at disposal and yet a high ambition - ideal recipe for innovative indians - I reckon ! Excellent article and a reality check for those who think the world is going back to what is was once like! @Aiden: Indeed - we're in round 4 of a 15 round bout! After a number of cautionary notes for India Centric service providers coming from you, this note is certainly a morale booster for some of us. The growth story of Indian IT has been amazing, which has happened because of many reasons including the one you highlighted on the customer centric approach and accessibility of senior management. Also as mentioned by Charles Sutherland in one of his earlier blogs, automation and its adoption is rapidly happening, which in my opinion will again bring about a shift in this industry. One constraint that Indian IT providers need to address fast is to develop more domain understanding and start delivering services which directly impacts the pain point of end business users. In my opinion we are still to see the unfolding of story on how some of the service providers would find it difficult to sustain their past growth rate. The recent whisper in the air regarding HCL being a potential takeover target needs some delving into. On a side-note It would be interesting to fathom the strategy that Hitachi Consulting and NTT have been pursuing. I like this article. We should also remember that there will be still a number of more complex deals at stake that require strong transformational capabilities that combine operation expertise, systems integration and deep industry knowledge not forgetting about investments that the providers will be expected to make in order to get into the engagement. It would be great to observe how our industry evolves and I am pretty sure that in the next five years we will be in completely different world! Excellent Post. 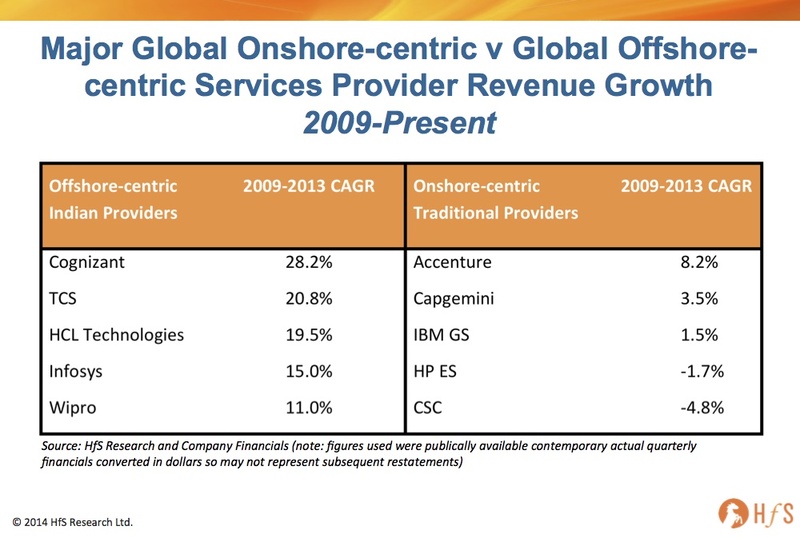 It shows how matured offshore centric providers are and delivering products with their quality and low cost to serve. So Phil… Are the Indians running the cowboys off of the range? Hi this is an excellent analysis. While all the points are valid, the growth in % terms alone is not an indicator. Many of the global players are 8 or more times bigger in $ terms compared to tcs cognizant or hcl and hence their % growth will not match that of the india based companies. Having said that the shift definetely have happeded in the perception of the india based service providers favor. Its no longer true that commodity jobs given to india based service providers and complex work go to global majors. One more aspect to consider is many of the clients have started to curtile their discretionary spend. Very rare to find 100 million multy year multy tower opportunities in the recent past where the global players were strong at. Very well written article Phil. I think going ahead one more thing which will turn the tide in favor of the Indian Players is their focus on the emerging markets. Most of the global players except Accenture have single digit revenue contribution from the emerging markets while all the Indian providers except Cognizant have a double digit revenue contribution from emerging markets. Currently the addressable market size in the emerging markets is low but with time it is bound to increase (as also reflected in a HfS Research 'Strategic Analysis of Outsourcing Deals in May 2014' where a few important deals were signed in Saudi Arabia and Chile). The emerging markets in future would definitely be a critical success factor and Indian players are expected to gain the maximum from it. Any thoughts on the same ?